When I first moved to Ventura County from Los Angeles, I skeptically but diligently began investigating the local poetry scene. What I discovered was a diverse, thriving community that welcomed me quickly. I spent a formative six years here, including two years in a low-residency MFA in writing program, trying out new poems at the Artists’ Union Gallery on Tuesday nights. How perfect then, having been featured at one of the first “Friday on Saturday” readings five years ago, to read poems from my new collection Human Shade to the community that has become a poetic family to me. Doris once again baked cookies, which prompted a man from the street to burst in while I was reading a poem. Fortunately Friday, outwardly graceful, but with a core of steel, makes not only a lovely emcee but an efficient bouncer. I re-read the poem. I will miss this enthusiastic and quirky community of artists and word lovers. While this was my last featured reading before we leave for London, I do have two ensemble readings schedule for April: at the Santa Barbara Contemporary Arts Forum on Sunday, April 10th at 7:00 PM, and at Frank Picture Gallery in Santa Monica on Thursday, April 14th at 8:00 PM. If you are in Southern California, perhaps I will see you there for a little sweet sorrow before I go. 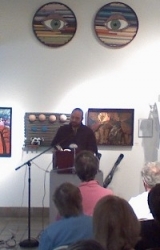 I had the pleasure of hearing Paul Fericano read poems new and old at the Artists’ Union Gallery last night. Paul’s is a distinct turn of mind — able to sweep up humor, irony, and deep feeling in a winning trifecta. Paul takes the materials of popular culture — from Elizabeth Taylor to The Three Stooges — and makes of them something transcendent. It is precisely in the moment I am laughing in a Paul Fericano poem that my guard is down. It is then when Paul slips in a modicum of pathos, reminding me of how complex it is to be human, how, as Virginia Woolf puts it in Mrs. Dalloway, “dangerous it is to live even just one day.” These are poems that read like the messages in a bottle that might be written by the last sane man on Earth, when everyone else has gone mad. I leave you with a poem that is fast becoming one of Paul’s most popular — read in Ojai at an event I was sadly unable to attend. I am grateful to whomever filmed it. 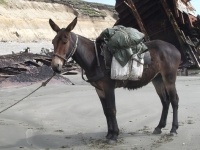 Sugar Mule #32 just went live online, bearing three of my poems. As fate would have it, I plan to read two of these three poems tonight at The Artists’ Union Gallery in Ventura. The reading begins at 7:30PM. Bring a poem or two for the open mic. And for those of you who can’t make it, for whatever reason — enjoy the poems! Poetry seems to attract highly sensitive people — sometimes vulnerably so — more than other art forms. Perhaps it allows us to protect the imagined children that are our own barefooted selves by picking up sharp fragments wherever we go, and assembling them into something sparkling and musical, as Tim did tonight. Or perhaps, like John, we are simply clearing a pathway, or a place to sleep. I was moved by Tim, whose love of poetry has led him through extensive study, and to editing a well-known journal. I was moved also by John, no less possessed of a poet’s turn of mind, who reflected to me, once again, the universality of poetic need. I wish them both a peaceful rest, wherever they lay their head tonight. Sarah Maclay drew me down to the seaside tonight, to hear her read poems from her first book, Whore , her second book, The White Bride , and selections from a new, unpublished manuscript. It was great to be back at the Artists’ Union Gallery, among friends. Sarah read poems back-to-back, like a line of train cars speeding down the coast through evening fog. And, as is the tradition at this venue, and precisely at the end of one of Sarah’s poems, the 7:50 freight blared through the dark. Though many of the poems she read were prose poems, her compelling imagery and sonorous delivery made her work sound as though it might have been written with the blade-like precision of couplets. For all of her unexpected imagery and captivating associations, Sarah is not a surrealist — in much the same way that a poet like Sandra Alcosser is not a surrealist. In fact, Maclay brings to the urban landscape much of what Alcosser brings to the wild places — rough, self-startling observations, deep sensuality, and a ravenous fascination with human concerns — all balanced with a keen, keen ear. It was a pleasure to hear Sarah read tonight, and to step out into the salt air, changed. I read a range of poems, many new pieces fueled by the MFA — and even some poems about the passing of our son. It was the first time reading them in public, save for a few I read in workshop at the last residency. It felt necessary — like it was time; another stage of honoring and letting go. I also dedicated the first part of the reading to the memory of Sandford Lyne, opening with one of his poems, reading a couple new translations I had done of Machado and Neruda (two of his favorites) and ending the first section with a eulogy in honor of his great spirit. The place was packed. Roe, our indefatigable host, joked that the event was a sell-out just like Mary Oliver’s reading last week (though Cambell Hall admittedly does hold one or two more people than the Gallery). Still, it was nice to see standing room only. More high praise and fond support: Doris brought her cookies and of course left with an empty bowl. I could not have had a more supportive group in which to read such intimate and personal poems. Seeing Li-Young Lee read from his own deeply sorrowful, grief-stricken poems last week gave me a model for what it means to honor the experience and honor the art even though it is deeply personal. I felt in some way that seeing him read gave me the strength to do what I had to do tonight.